In Lamps > Table Lamps > Show & Tell and Art Glass > Loetz Art Glass > Show & Tell. Finally received my Lamp! I think it was produced by Kralik, ca. 1900-05 ish.. measures 21" tall with shade. The Shade is a nice size measuring 5 1/2" tall with a 2 1/4" fitter, the shade has a pulled feather decor over Kralik's version of Candia Papillon.. 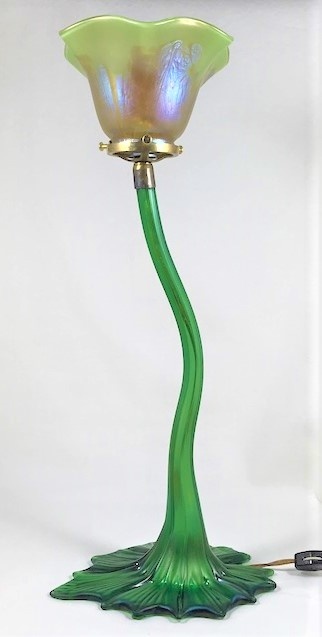 The base of the lamp is green iridized glass and is quiet unique! 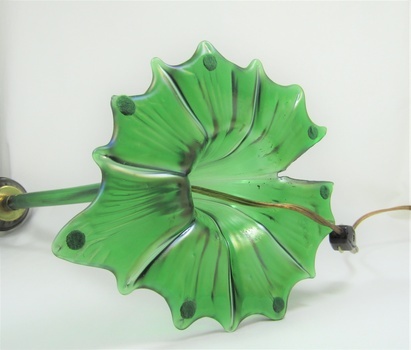 I have seen one other lamp like this but it has a Floriform shade and an expensive price tag! a very very beautiful Lamp!! Glassie, very nice shape,, and lamp. Fabulous lamp. What a perfect base. I would love to have one to use with so many much loved single shades in my collection. Gary, that sir, is a fabulous find. Enjoy your new treasure. It is amazing it lasted all these years.....beautiful lamp. Lisa, I have a few Shades I can to do that as well! anxiously and desperately looking for a replacement fitter!